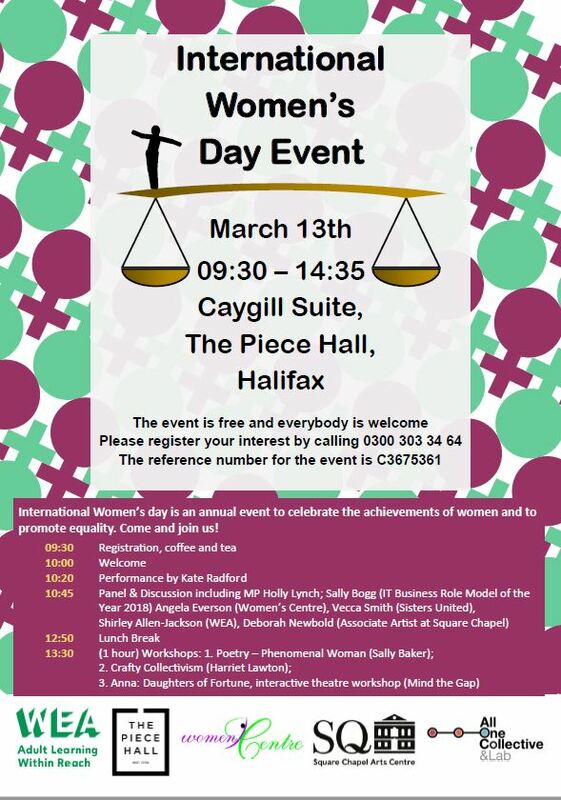 There will be an International Women’s Day event taking place on Wednesday 13 March, 9:30am-2:35pm in the Caygill Suite at the Piece Hall. The aim of the event is to celebrate women’s achievements and to explore the next steps in terms of the promotion of equality. The event is a partnership event between the WEA, the Women’s Centre, All 1 Collective, Square Chapel and the Piece Hall. Everybody is welcome at the event and we would really appreciate if you could promote the event to your staff and community groups. They would be really grateful if you and anybody interested in coming could register by calling 0300 303 3464 with the event reference C3675361, as this helps to estimate numbers. This entry was posted in Events, Mar and tagged #IWD2019, International Women's Day.